I will admit it: I’m a lazy investor. Especially for my smaller positions I often forget about the stock after having done the initial valuation work. Sure, I follow the price/news/filings to see if anything significant is happening, but often it’s just business as usual. That doesn’t mean that fundamentals can’t deteriorate gradually, or that the price can climb slowly. And those small changes over time can add up to change the investment case. Because of that I started this month with a bit of a cleanup project. I’m reevaluating all my positions, and adding to them or selling them as I see appropriate. The first casualties of my cleanup project are Awilco Drilling (OSL:AWDR), Fujimak (TYO:5965) and PV Crystalox Solar (LON:PVCS). My reason for selling PV Crystalox Solar is simple. I primarily invested in this company because it is on a path towards liquidation and was trading at a near 50% discount to NAV, but with the share price increasing from 10p/share last year to 21p/share now this discount has almost completely disappeared. The stock was actually trading even higher around 24p/share just two days ago, but the preliminary results for 2016 were not well received by the market. The company managed to turn a lot of its inventory into cash (as expected), but the industry environment once again deteriorated sharply during the year. While the discount to NCAV is gone there might still be a decent amount of upside. The company is involved in an ICC arbitration case against a former customer that might result in a large favorable judgement. This is expected to happen in the third quarter of this year, but I have decided not to wait around for this, because I have no clue how to value this and it’s not a free option anymore. If I would encounter this stock for the first time today I would not buy it so I’m not keeping it either. I acquired my first shares of Crystalox in 2013 and they have returned 110% since. The second position that I sold, coincidentally also today, is Fujimak. I bought this stock at the end of 2014, basically because it was super cheap when looking at simple metrics like P/E and net cash per share. The past weeks the stock suddenly started to move up, and I managed to exit with a total profit of 100.2% (after taking into account two small dividends). Despite the rise in price the stock is still very cheap. 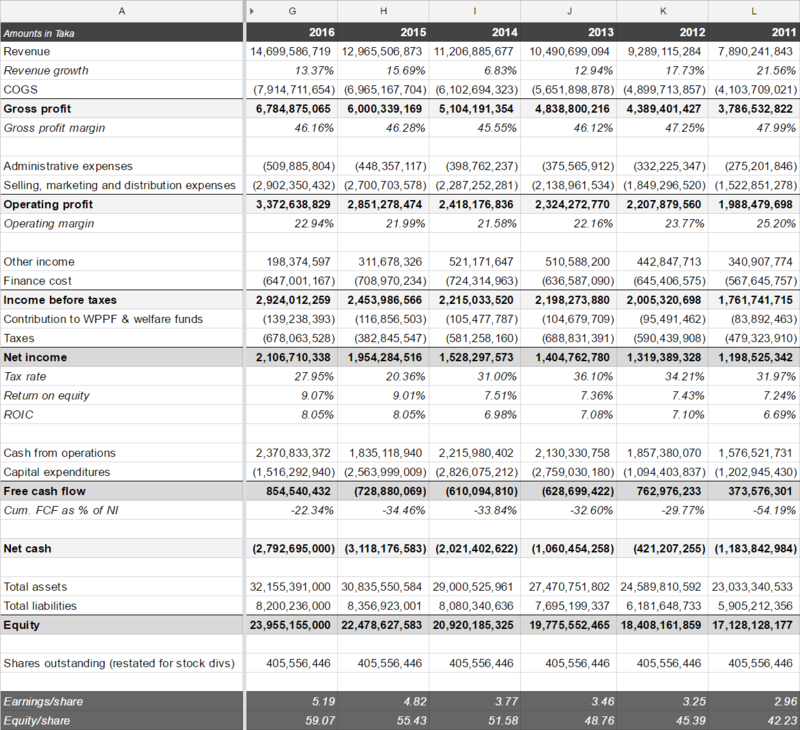 Valuing the cash balance at 50% and slapping a 8x earnings multiple on the company and it’s still trading at a discount of ~30% to this conservative estimate of value. Not a bad deal, but in Japan you can do better than this. A position that has been on my ignore list for a long time is Awilco Drilling. I bought the stock early in 2013 when it had two drilling rigs under long term contracts that, according to my calculations, would generate roughly enough cashflow and dividends to pay back my initial outlay. With oil prices high at the time it was not an unreasonable assumption to think that the company would most likely be able to rent out the drilling rigs again when the two contracts would end. Of cours, we now know that that didn’t happen and as a result one rig is currently cold stacked while the other rig will reach the end of its contract in the first half of 2018. I bought the stock at 90NOK/share, received 75NOK/share in dividends and sold the stock for 31.8NOK for a total profit of 18.9%. That’s in absolute sense not a whole lot (especially considering the holding period), but at the same time I’m extremely pleased with this result. Despite encountering one of the most unfavorable scenarios possible I managed to generate a positive return. At the same time it also validates the correctness of my initial thesis since I did indeed managed to get most of my capital back. 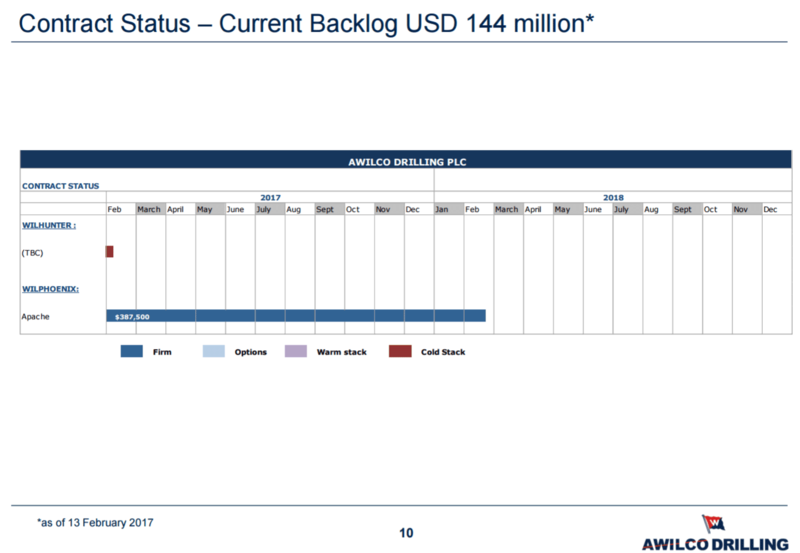 Right now the share price of Awilco Drilling is absolutely not covered by the future cash flows from the contract that is left. I think they might generate roughly 15.5NOK/share in dividends, and the remaining value is a bet that either the rigs can be sold or that the situation changes in the coming years and they can find some work again. With my original thesis gone I don’t see a reason to stay invested. Besides selling stock I have also added significantly to my position in Beximco Pharma. Just two months ago I wrote that I sold a large part of my Beximco Pharma stock since the discount between the GDRs in London and the ordinary shares in Dhaka had come down from 60% to just 25%. 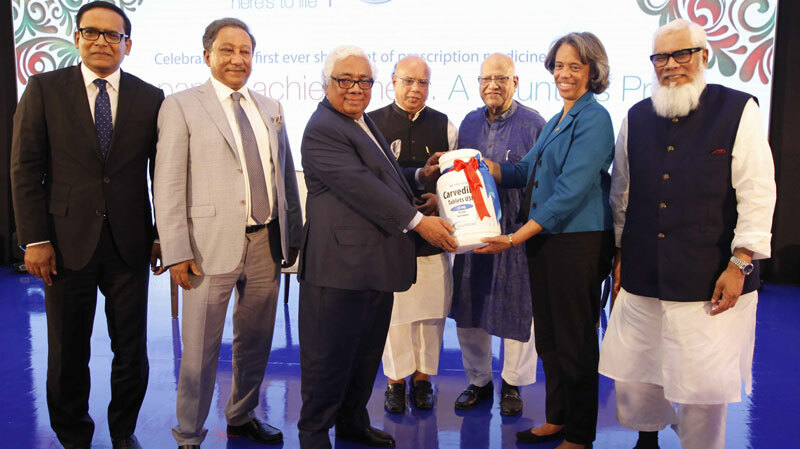 Since then the stock price in London has slipped again while the price in Dhaka continued its upward trajectory, and as a result the discount is now back to exactly 50%. This doesn’t make any sense, but I’ll happily continue to buy low and sell high as long as the market is willing to provide those opportunities :). This entry was posted in Portfolio and tagged 5965.JP, AWDR.OL, BXP.L, BXPHARMA.BD, PVCS.L on March 24, 2017 by Alpha Vulture. 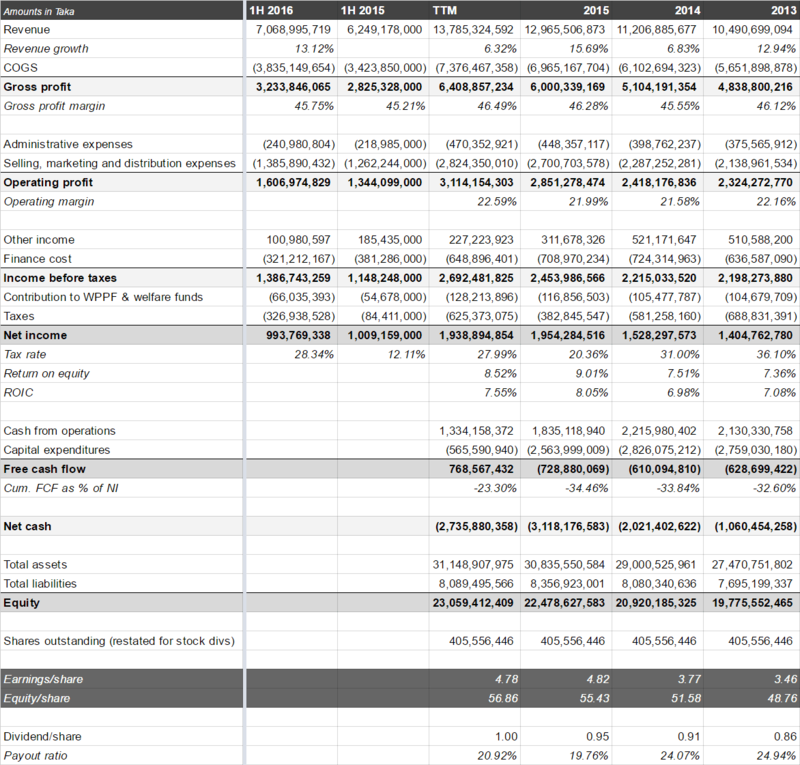 I recently trimmed my position in Beximco Pharmaceuticals (LON:BXP) a bit since the discount between the share price in Dhaka and London has shrunk from the original 60% to 39% at the time of writing this. However, it remains my biggest position, so I continue to follow the stock closely. The company reported results for the third quarter of 2016 today. 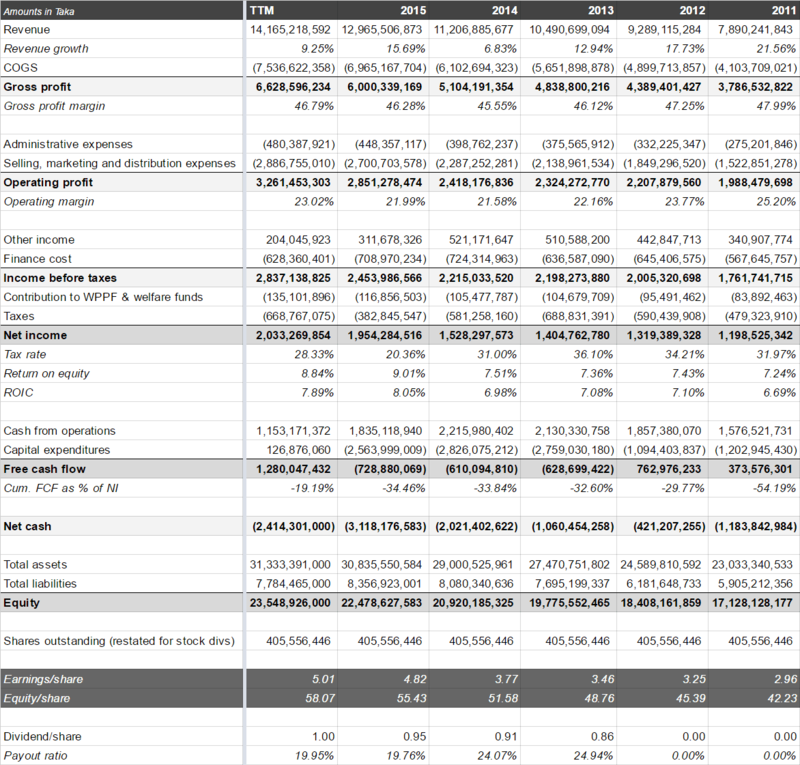 The press release doesn’t contain anything besides the raw financials, but those numbers look good. Revenue grew with 11.2% compared to the same quarter last year while EPS grew with 22% from 1.04BDT/share to 1.27BDT/share. Note that my per share numbers are slightly lower than those reported by Beximco Pharma, because I’m already accounting for the stock dividend. The shares are currently trading ex-div for the 5% stock dividend, but probably because the dividend hasn’t formally been approved by shareholders (the AGM is the 19th this month) the new shares aren’t yet recognized in the financials. Even with the higher number of shares the stock remains relative cheap: trading at a 9.9x P/E-ratio while it has good growth prospects. Compare this to Dhaka where investors are valuing the same shares at a 16.4x multiple. This entry was posted in Portfolio and tagged BXP.L, BXPHARMA.BD on November 15, 2016 by Alpha Vulture. As you can see the results in the first half of 2016 were pretty good. Revenue grew with 13.12% thanks to a 5.3% increase in export sales and 13.6% more domestic sales and the period doesn’t yet include the start of the sales of Beximco Pharma’s first drug in the USA. Pretax profit is up 20.8%, but due to abnormal low taxes in the first half of 2015 net income is down a bit. Overall good results, and with the stock up 8.4% in London at the time of writing this, the company is getting more expensive compared to my entry in 2014. At that time you could effectively buy the company at a 4.3x P/E-ratio and a 0.31x P/B-ratio in London. Now it’s trading at a 9.0x P/E-ratio and a 0.78 P/B-ratio. Still not expensive, and the discount compared to the price in Bangladesh remains consistently high. Because the results were released after the market closed in Bangladesh I cannot give you an exact discount. Using stale data from Bangladesh, it’s still 43%, but I expect that it will be back to 50% again tomorrow. While the company is getting less cheap when we look at simple valuation metrics I think this discount is the most meaningful, I don’t have any plans yet for exiting my position as long as it persists. This entry was posted in Portfolio and tagged BXP.L, BXPHARMA.BD on October 20, 2016 by Alpha Vulture.